Annotation: Now in a bilingual edition, this retelling of a classic story finds Jack Rabbit convincing everyone in the desert, from Armadillo to Vulture, to add something to his Tumbleweed Stew. Full color. - Spanish language materials; Bilingual. 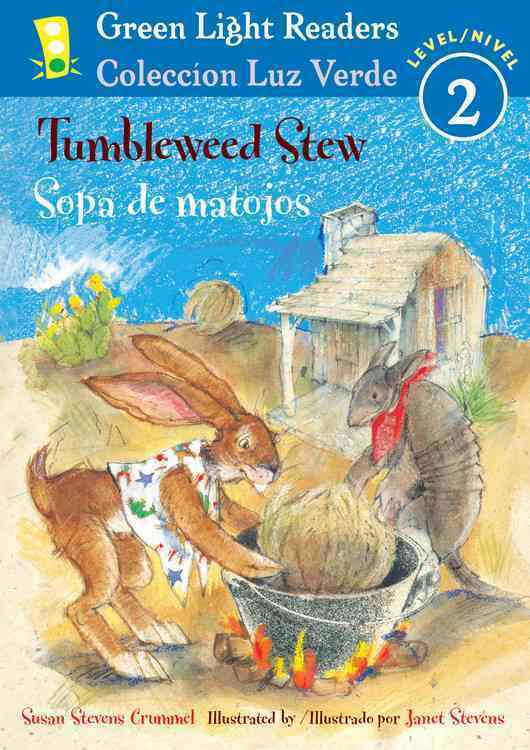 In this Southwest-flavored "Stone Soup" retelling, Jack Rabbit delights Two Circle Ranch by offering to make a tasty tumbleweed stew. Each new ingredient has its own picture, providing a handy vocabulary lesson. Humorous illustrations of desert creatures wearing cowboy accessories will amuse young readers. The pages are crowded with text in both English and Spanish. Copyright 2010 Horn Book Guide Reviews.